For engineering companies who want to increase their brand and product awareness, trade shows are a great use of time and money. By combining exposure and personal interaction, companies can expose themselves to a large number of potential leads, offering an experience for the business and attendee that no other form of marketing can replicate. Exhibiting at trade shows however, can be very expensive and you might only have the budget to display at one or two. With this in mind, you should determine which show will be the most profitable to attend. What is it? Southern Manufacturing & Electronics is the largest regional manufacturing technology, electronics and subcontracting exhibition in the UK. Why should you attend? The exhibition caters for a range of disciplines, including precision machining, fabrication and manufacturing technology. However, the electronics sector is where the event really comes into its own, as it boasts a dedicated subcontract section - Southern Electronics. Industry sectors: Electronics, automotive, aerospace, precision machining, fabrication, manufacturing technology. What is it? Subcon the UK’s premier subcontract manufacturing supply chain show dedicated to outsourced engineering services. Why should you attend? With over 40 years under its belt, Subcon is the go-to event for subcontract manufacturing buyers looking for suppliers, benchmark capabilities, and secure contracts in order to remain competitive in a global market. Admission is free too! Industry sectors: Automotive, Aerospace, Electronics, Materials, Energy, Rail, Oil & Gas, Defence & Security. What is it? The Engineer Expo is dedicated to providing UK engineering professionals with the latest in-house manufacturing and design solutions, alongside cutting edge developments in advanced engineering technologies. Why should you attend? The show provides a unique platform for engineers to source the latest advanced engineering technology, products and services, enabling them to optimise production and process throughout the manufacturing cycle. What is it? The National Engineering Summit is dedicated to facilitating knowledge sharing and collaboration and to connect buyers and sellers in UK and Ireland. Why should you attend? 2018 is the show's launch year and tickets are free. Industry sectors: Construction, Electronics, Bio Engineering, Manufacturing, Energy, Utilities. What is it? Advanced Engineering is for advanced engineering professionals. It connects the entire supply chain of the UK’s advanced engineering industry with R&D, design, test, production & procurement from OEMs & top tier industry players. Why should you attend? The show incorporates all aspects of engineering, from materials, to logistics, to subcontract services. You can also meet OEM’s and engineering supply chain professionals from design, test & inspection, production, assembly, automation and materials processing. Industry sectors: aerospace, automotive, defence, oil & gas, marine. Trade shows and exhibitions offer engineering companies an excellent opportunity to meet, network and be inspired by industry professionals, and benefit from a captive group of potential customers. 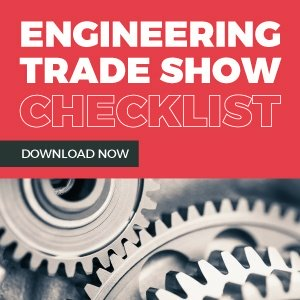 If you’re seriously thinking about attending a trade show, then why not check out our Trade Show Checklist to help you on your way! Or if you need help designing your trade show stand, read our 10 exhibition stand design tips. With so many available on a national a global scale, it can be difficult to choose which one is best for your business; Do your research and take full advantage of your time at the event.